For use with TimeMist® Metered Aerosol Dispensers (sold separately). Air freshener refills for use with TimeMist® Metered Aerosol Dispensers. 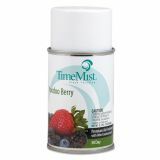 TimeMist Metered Fragrance Dispenser Refill, Voodoo Berry, 5.3 oz, Aerosol - Premium-quality air freshener contains uniquely formulated, long-lasting fragrances and effective odor counteractants that neutralize stubborn odors swiftly and provide lasting aromatherapy. 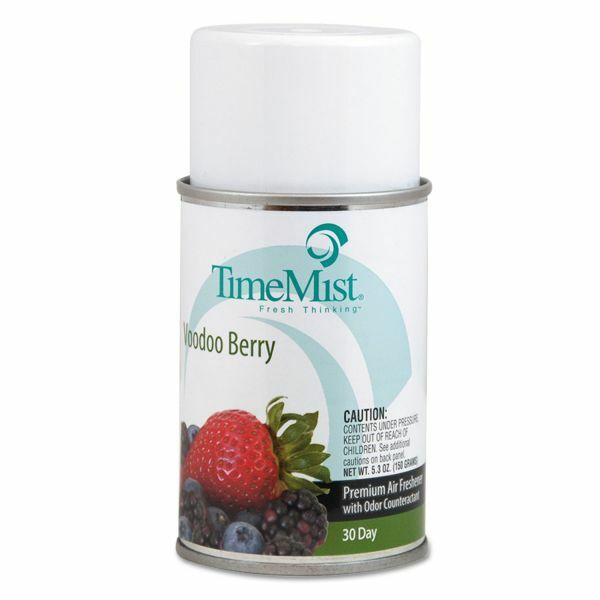 Use Voodoo Berry scented refill in TimeMist full-sized, metered fragrance dispensers. Air freshener is formulated to counteract odors and leave behind a pleasant aroma. Air freshener contains a low VOC formula. Sprayed with a dispenser, the refill is effective for up to 6,000 cubic feet and lasts 30 days.